Gender equality is a top issue of discussion these days. So how do women and men compare when it comes to family finances? Over the last two decades, the number of women breadwinners has been steadily on the rise. Today, 49 percent of employed women in the United States are working because they are their family’s primary breadwinner, according to a joint NBC News-Wall Street Journal poll. That number includes 42 percent of working women who are raising children. Even though nearly half of working women are the main wage earner in their family, significant inequalities remain when it comes to personal finances. Women are paid an average of 20% less than men, according to the National Women’s Law Center. That translates to a loss of $10,470 a year in median income, or $418,000 over a 40-year career. Women face other financial challenges as well. A 2018 Time/Money report on women and financesrevealed that in addition to a gender pay gap, there is also a gender investment gap. 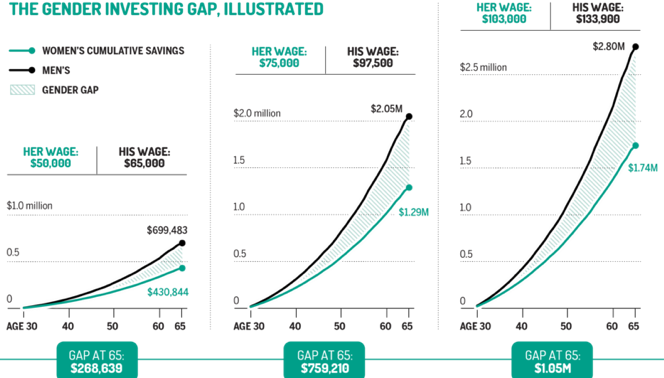 Women invest less and start investing later than men do, a mistake that may cost women more than $1 million over a 35-year career. Women also typically pay more for credit, carry larger levels of debt, and face a higher health care tab because they live longer. 90% of women will be solely responsible for their finances at some point in their lives, according to Fidelity. That means whether you are the primary earner for your family, living with a higher earning partner, or single, you need to take an active role in your finances. Less than 50% of women are satisfied with their bank account balances, retirement savings, net worth, or other financial aspects of their lives. There are steps that women can take to improve their personal finances, whether you are a breadwinner or not. While these tips can’t address the income gap women face, they will ensure you are in a better financial position to face the future. Only 41% of women say they are satisfied with their knowledge about finances. Learning how to plan your finances as a womandoesn’t mean being patronized or treated differently; it simply means finding an advisor who understands the challenges you face. Find a financial advisor you are comfortable with, who will work with you to devise a livable financial plan that balances investing and saving for the future with the need to pay off debt. Women typically carry 71% of their assets in cash, compared to 60% for men. That’s a real problem, because the purchasing power of cash decreases over time. A study by Fidelity Investments found that only 9% of women believe they are better investors, while Fidelity’s client data analysis shows that women actually earn an average 0.4 percent higher returns on investments than men. That may not seem like much, but it adds up over time. Women need to resist their bias against investing and adjust their asset allocation.Work with a financial advisor to find the best investment mix for your age, risk tolerance, and income needs. Saving for retirement should be a priority for women, whether you are the primary earner for your familyor not. Only 33% of women have clear retirement goals, compared to 45% of men. Have your retirement contribution taken directly out of your paycheck, and opt to have your retirement contributions automatically increased by 1% a year. Whether you are a breadwinner for your family, single, or living with a partner who earns more than you, if you would like some help with financial planning, reach out to financial advisor Matt Logan at www.mattloganinc.com or call 336-540-9700. We understand the unique financial challenges that women and men face. We will work with you to create a financial plan that addresses your specific needs and leaves you in a better position for retirement.